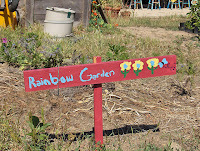 Making a sign for your garden is a really neat way to make a unique statement in your garden -- even if you aren't any good at gardening. I've shared loads of ideas here to get your juices flowing, and some of them are even suitable for the kids so it keeps them busy too! Why Not Carve Your Own Sign? 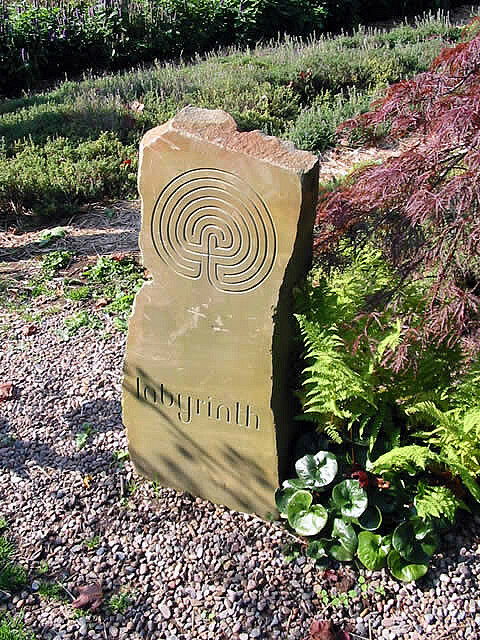 One method of making your own garden sign is to carve one from stone or wood. Whether you want to carve into wood or stone you need to make sure it won't move as you are working, so clamp it securely. Borrow, hire, or purchase second hand, rudimentary carving tools - a small size chisel, gouges, a mallet and large V tool. Sketch out your design in pencil, using letter stencils if you wish. Use the V tool to roughly take out as much of the marked out area as you can, starting from the centre and working outwards, staying within the outline. Work vertically along the bottom of each letter using a chisel for the straight parts, and gouges for the curved sections. Perfect the edges of the letters by cutting them with a sliding motion. Smooth any rough edges with sandpaper. 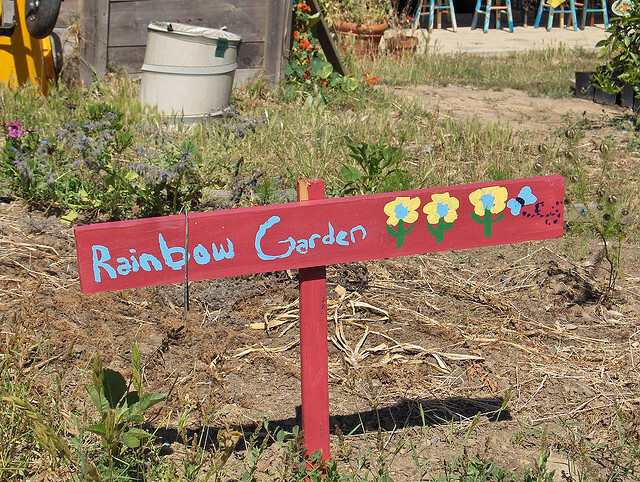 Make your own statement by creating a garden sign that truly integrates into the garden. 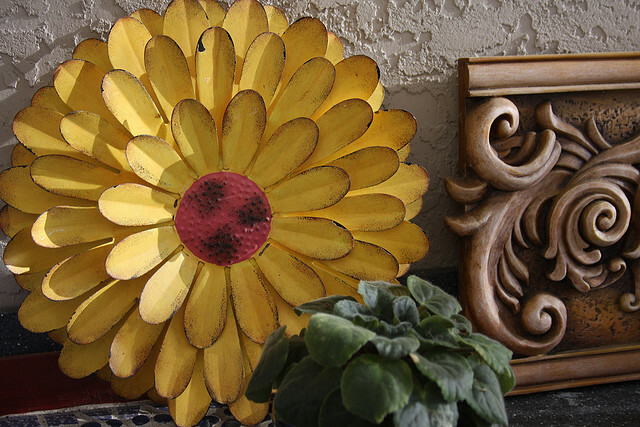 One way to do this is by creating a flower shaped sign from old tin cans to mingle with the real flowers in your garden. This is a great way to repurpose junk into garden art, not just a garden sign. Wash out lots of drink cans, cut off the tops and bottoms, and make a cut down the side. Flatten out into a metal sheet. Make a paper template of your chosen shape. Lay the template onto the metal sheet and cut around it. Use more than one sheet, if you need to, by gluing several pieces together with a glue gun. Paint with an enamel paint, leave the metal bare, or use the other side with the drinks logo on. Paint on your sign's message. Mount onto a wooden stake or metal rod, using wire and a glue gun. Plant in amongst your plants, or into a plant pot of its own to make a real stand-out focal point. 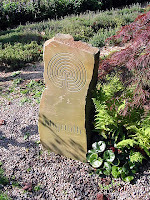 Reuse slate tiles as garden signs and let the children go crazy with chalk, changing it according to their mood. Go the Fawlty Towers route, and create a sign with move-able letters. Magnetic letters can be purchased from toy stores, and a shaped piece of magnetic metal can be used as the base - not all metals are magnetic (aluminum, brass and copper won't work). Or buy the base from a toy store too - often the opposite side of a child's blackboard will be magnetic. Raid your craft stash and make a unique sign using polymer clay. Letters and shapes can be cut out using cookie cutters, or get the kids to mould some flowers or animal shapes. Also try making letters from a "snake" of polymer clay. Adhere to a piece of wood, or fix onto the bottom of decking or raised plant beds. A large glass vase can be made into a garden sign easily, using glass paints to decorate and write on the message. Weigh it down with large pebbles placed inside and around the base. You could incorporate candles inside to make an illuminated sign for a magical nighttime glow. 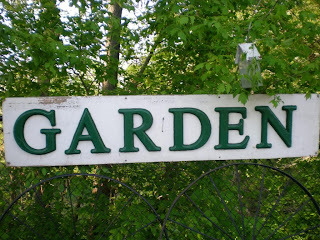 Make a garden sign your very own, by using ready made wooden letters, bought from a craft store. Paint and customize them as you wish - add metal buttons or craft gems, or stick on cut out nature-shapes such as ladybirds. Stick into the ground mounted on stakes, fix to a fence or garden wall, or hang off trees and shrubs by wire or string. 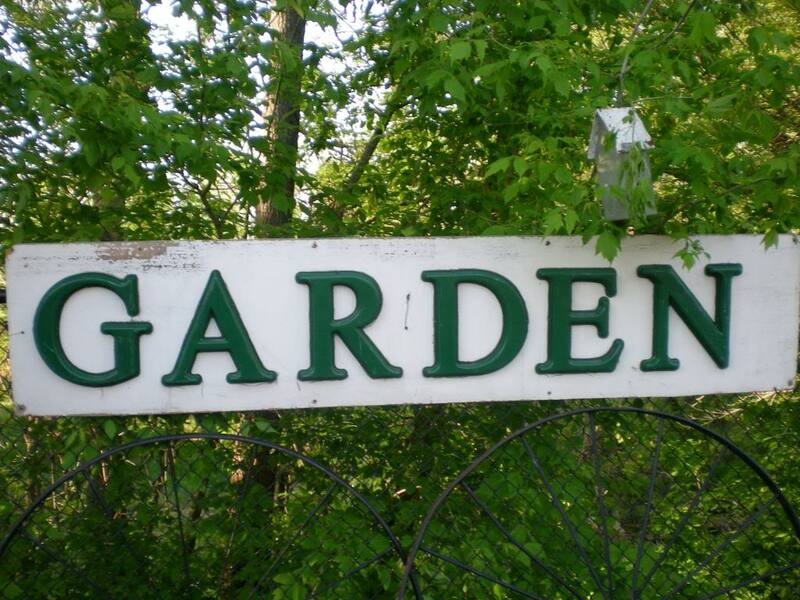 The most important thing when making your own garden sign is that it fits in with the feel of the garden, and that it reflects the personality of the people that spend the most time there - enjoy creating!